Miss West, a 50-year resident of Oak Bluffs, is the author of many short stories and two novels, and she is the sole remaining member of the Harlem Renaissance. At Friday’s party, she was thanked for her work by an impressive list of officials. It was an event that featured lots of gifts and speeches, and Miss West, who is well known for her aversion to publicity, was nevertheless persuaded to come to the front of the crowded chapel, where she spoke briefly about her life and work. But then, many people of all ages seem to love Miss West. People began arriving for the event two hours early. By the time it began, every seat was taken and people stood in the back of the chapel, in the open doorways and on the lawn. Inside the chapel, professional photographers pointed telephoto lenses at the tiny Miss West, who is less than 5 feet tall. The fanfare was appropriate for a woman with a unique career. Miss West, the daughter of a former slave, originally of Boston, achieved prominence at the age of 17 when her short story, The Typewriter, tied for first place in a writing contest. Miss West shared the honor with a more experienced writer, Zora Neale Hurston. From then on, Miss West was a noted member of the Harlem Renaissance. In 1934, she founded the literary magazine Challenge, and a few years later, New Challenge. 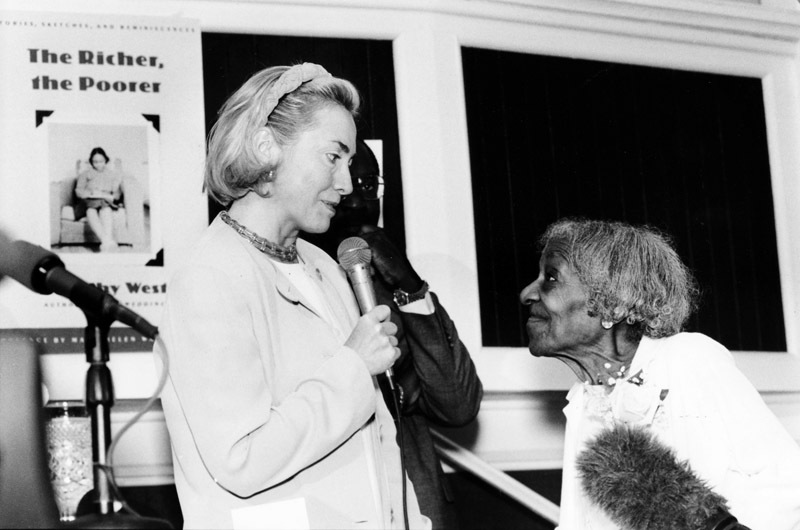 She worked as a welfare investigator and a WPA relief worker in Harlem during the Depression. She moved to Oak Bluffs year-round in the 1940s, and she wrote a column for the Vineyard Gazette for many years. Her first novel, The Living is Easy, was published in 1948. Her second novel, The Wedding, was one she finished two years ago, after having set it aside years earlier and then being prodded into finishing it by her friend Jacqueline Kennedy Onassis. The Wedding will become a television miniseries, produced by Oprah Winfrey, in 1998. It is a story set on Martha’s Vineyard, about a prominent African-American family that prefers for its daughters to marry light-skinned black men who support themselves with respectable professions. The crisis of the story is the youngest daughter’s decision to marry the wrong sort, a white man who plays jazz. In honor of this work and her many others, the chapel was decorated with yellow and orange roses and with simple computer-printed signs that said, “Happy Birthday Miss West,” and “We love you.” Posters depicting the covers of her two most recent books also were displayed. Before this backdrop, Mr. Ogletree described Miss West as “one of the most gifted writers of all time.” And then several presentations were made, and gifts given. Three noted African-American scholars read from Miss West’s works: Harvard University scholar Henry Louis (Skip) Gates Jr., former University of Oklahoma law professor Anita Hill and author Jill Nelson. Opera singer Jessye Norman sang Ave Maria, Every Time I Feel the Spirit and Happy Birthday. A letter was read from acting governor Paul Cellucci, who recently proclaimed that July 2, the writer’s birthday, is now Dorothy West Day. A letter was read from Oprah Winfrey. A birthday cake, decorated with the cover illustration from The Wedding, was presented by four youngsters: Jordan Adams, Carolyn Allston, Autumn Thomas and Steven Williams. And in a special announcement, Oak Bluffs highway superintendent Bert Combra and planning board chairman John Bradford announced that Vineyard avenue in the Highland area of town will no longer have that name; it is now Dorothy West avenue. For people in the audience, the event was enjoyable. Similarly, summer resident Brenda Davenport said Miss West’s energy is inspiring. Miss Davenport, an elementary school teacher, skipped the first day of school back home in Baltimore in order to attend Miss West’s party. It was worth it, she said.